Ifs just the beginning of Newco performance. SAFE-O-SEAL design for critical pressure and temperature situations is on the military Qualified Products List. You also get the benefits of a nationwide warehouse network that includes portside distributors who can fill your needs quickly at competitive prices. Whether it's new construction, retrofit, or routine replacement on everything from barges to the largest tankers, you can depend on Newmans and Newco marine valves to meet your total shipboard needs. And that includes modifications and hard-to-get speciality items. In fact, what's special to many may be standard for us and our distributors. Fit a Newco valve into your plans today. 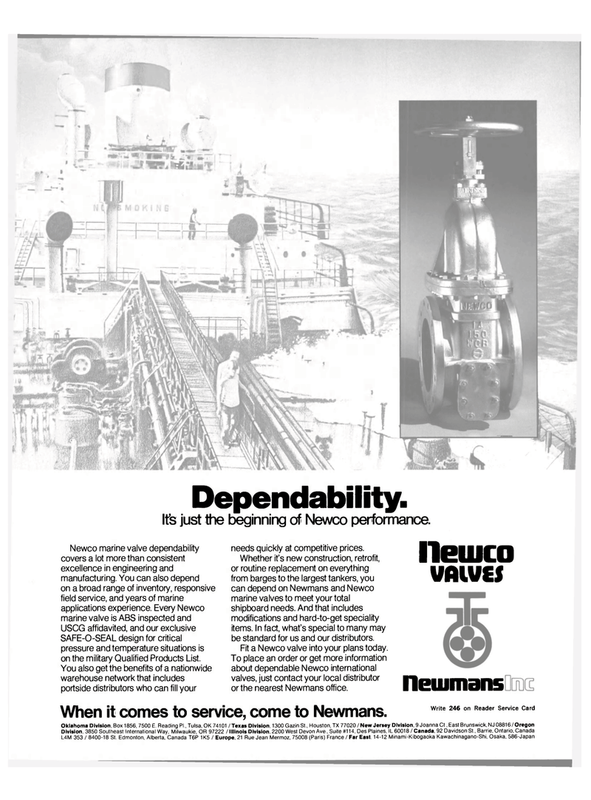 To place an order or get more information about dependable Newco international valves, just contact your local distributor or the nearest Newmans office. Write 246 on Reader Service Card When it comes to service, come to Newmans.